If you’ve spent any time surfing in the greater New York metropolitan urban center area you should acquaint yourself with two of the more luminous characters in the scene. Often quiet in their own ways their relationship with New York surfing is long and celebrated. Mike Nelson and Matt Clark are fixtures in the New York Surf scene, documenting almost every swell between the two of them since 1990. Add to that the that both have recently bagged SURFER Magazine covers and the opportunity presents itself to witness the work of two surf photographers in the hard earned flow of observation and perspective. Matthew Clark (b. 1983) is an American photographer born and raised in New York. Clark’s work explores his relationship with the ocean through intimate portraits of breaking surf with the intention of capturing something private, personal, and unique about each wave. His photographs are the delicate, yet powerful, and capture elements of moving water and reflections of light in churning surf. The ability to capture these moments come from his expertise in water from a lifetime of surfing in New York and experience in the cold Atlantic water. His work was recently featured as the first ever image of a New York wave on the cover of Surfer Magazine and was awarded the 2nd Annual Follow the Light Foundation Grant in 2007 by Surfing Magazine. Mike Nelson is a self taught photographer that has been capturing images of the surfing world for the past 20 years. Mike’s photographs have been featured in some of the largest editorial and advertising campaigns across the globe. Mike also co-owns and operates unsound surf shop, a fixture in the Long Beach scene and can be found almost patiently waiting for the next major swell just like any shop grom. 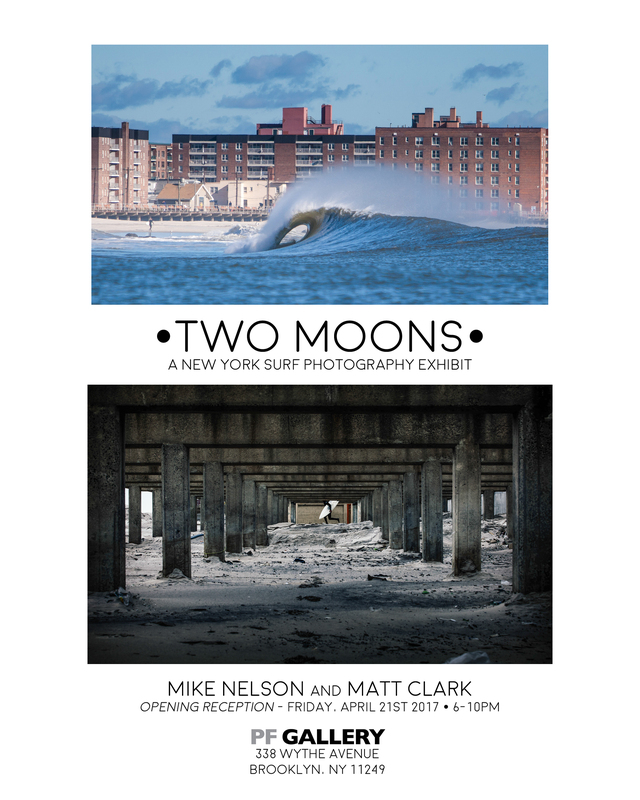 Two Moons highlights the two contrasting styles of both Matt Clark and Mike Nelson. They can both be shooting the same swell, at the same surf spot with the same surfers and will come up with completely different results and points of view. Few photographers have as great of access as Matt and Mike do to some of the best surfers and surf spots in the New York/New Jersey surf world.